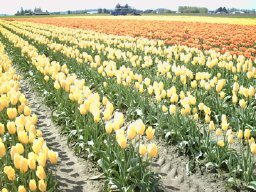 Skagit photos: One of the coolest places to take pictures is the Skagit Valley Tulip Festival. Overall, Seattle is an awesome place for pictures and every time we go there we seem to always fill up our memory card on the camera. 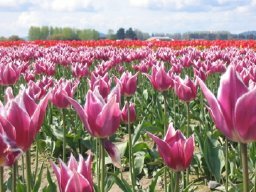 However the Seattle Tulip Festival is a great place for pictures because there a ton of flower fields all over the place. 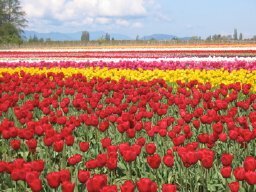 Well, if you haven't had a chance yet to make it to the tulip festival, here are some photos of the Skagit Valley Tulip Festival that will have to tie you over until you get a chance to go with your family. Some beautiful pink and white tulips we saw. One of my favorite sights, seeing the whole rainbow view of tulips. 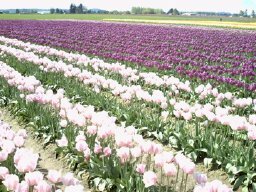 Purple and pink tulips: this is a great combination of colors. 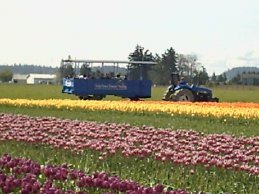 For a couple of bucks you can get on a tractor and ride around some tulip fields. This is helpful if you don't feel like walking around or if the ground is muddy. Orange and yellow tulips: This is my favorite combination of colors for sure.